A short hike today to Lake Ranch above Los Gatos gave us nice views of three killdeer, a duck family with six ducklings, a hunting egret and a host of other birds. But on the way back, we met an unusual little fellow on the trail. It was a young alligator lizard, one of the smallest I've seen -- which is still fairly sizeable for a lizard, maybe eight or ten inches long including the long slim tail. 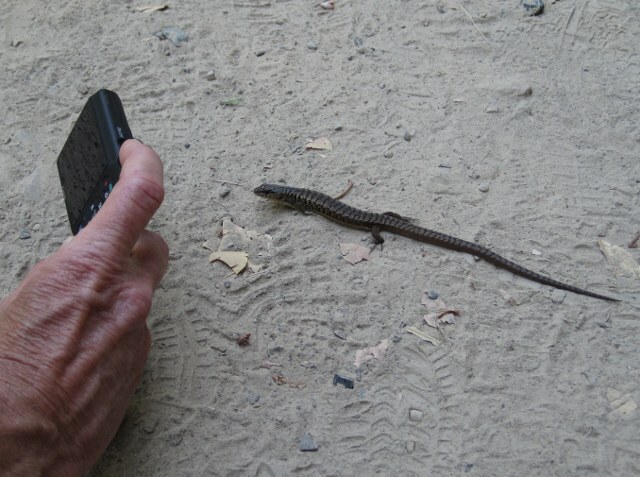 In typical alligator lizard fashion, it was lying motionless on the trail. So in typical Dave and Akkana fashion, we whipped out our cameras and switched into macro mode. 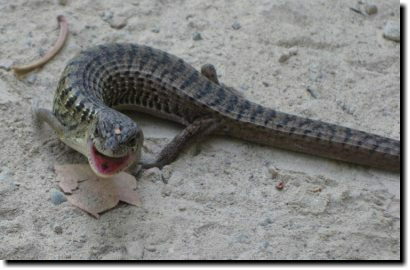 Alligator lizards are normally very placid. It's hard to get them to move under any circumstances, as long as you don't touch them. You can shoot photos from all angles, get the camera right up where you have to shoot a panorama to get the whole tail in, move around to the other side and get a different angle, and the lizard won't move. Imagine our surprise, then, when the little one opened its mouth and started threatening us! Dave pulled back his camera (it's his a new toy, so I was letting him shoot the up-close macros while I stayed what I thought was a comfortable foot away) and the beast turned on me and started advancing, mouth still open. I snapped a few shots while pulling back slowly. Then he made a rush for me. I pulled my camera, and fingers, up out of his reach -- supposedly alligator lizards can bite, though it's hard to see any evidence of teeth in the photos -- and he rushed my shoes. I lifted the foot he was headed for, and he darted under my shoe, turned on a dime and skittered toward Dave's hiking shoe. But I guess when he got there he didn't find it quite as vulnerable as he'd hoped, so he turned again and ran off toward the side of the trail, leaving us stunned -- and doubled over with laughter. I actually tried to shoot a video of his advance, but once he rushed me I was too busy getting out of his way and missed most of the action. Evidently I'm not quite ready to shoot those National Geo documentaries. That's a bit of dry leaf on his forehead, in case you're wondering. 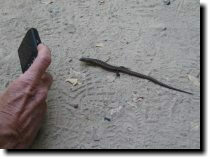 Here's what Dave was doing that got the little lizard annoyed. 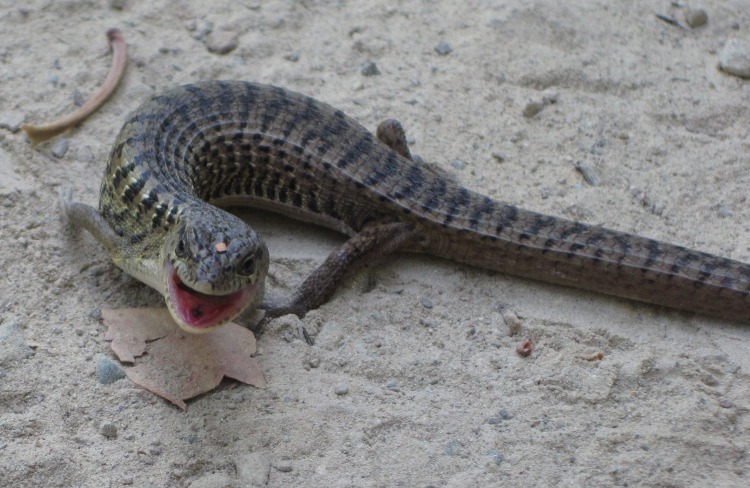 The adult alligator lizards we see don't mind that a bit ... honest! Some time ago, I wrote about my explorations into the options for driving motors from an Arduino. Motor shields worked well -- but they cost around $50 each, more than the Arduino itself. That's fine for a single one, but I'm teaching an Arduino workshop (this Thursday!) for high school girls, and I needed something I could buy more cheaply so I could get more of them. What I found on the web and on the Arduino IRC channel was immensely confusing to someone who isn't an electronics expert -- most people recommended things like building custom H-bridge circuits out of zener diodes. But it's not that complicated after all. 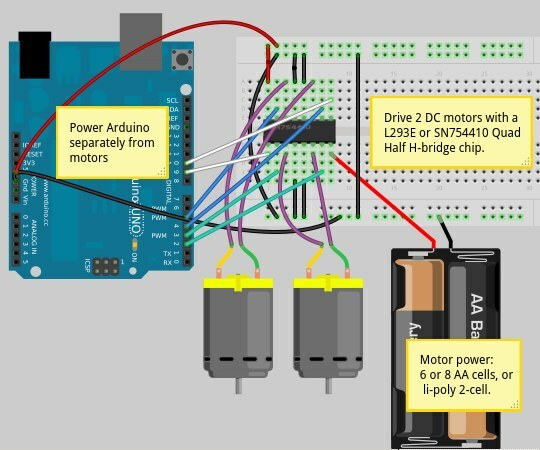 I got the help I needed from ITP Physical Computing's DC Motor Control Using an H-Bridge. It turns out you can buy a chip called an SN754410 that implements an H-bridge circuit -- including routing a power source to the motors while keeping the Arduino's power supply isolated -- for under $2. I ordered my SN754410 chips from Jameco and they arrived the next day. Now, the SN754410 isn't as simple to use as a motor shield. It has a lot of wires -- for two motors, you'll need six Arduino output pins, plus a 5v reference and ground, the four wires to the two motors, and the two wires to the motor power supply. Here's the picture of the wiring, made with Fritzing. With all those wires, I didn't want to make the girls wire them up themselves -- it's way too easy to make a mistake and connect the wrong pin (as I found when doing my own testing). So I've wired up several of them on mini-breadboards so they'll be more or less ready to use. They look like little white mutant spiders with all the wires going everywhere. The programming for the SN754410 is a bit less simple than motor shields as well. For each motor, you need an enable pin on the Arduino -- the analog signal that controls the motor's speed, so it needs to be one of the Arduino's PWM output pins, 9, 10 or 11 -- plus two logic pins, which can be any of the digital output pins. To spin the motor in one direction, set the first logic pin high and the second low; to spin in the other direction, reverse the pins, with the first one low and the second one high. That's simple enough to program -- but I didn't look forward to trying to explain it to a group of high school students with basically no programming experience. Setting a negative speed will tell the library to reverse the logic pins so the motor spins the opposite direction. 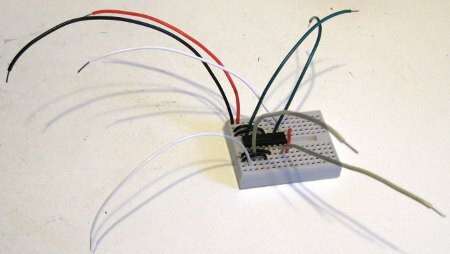 Cheap and easy motor control -- and I have a fleet of toy cars to connect to them. I hope this ends up being a fun workshop! I ran ubuntu-bug to report a bug. After collecting some dependency info, the program asked me if I wanted to load the bug report page in a browser. Of course I did -- but it launched chromium, where I don't have any of my launchpad info loaded, rather than firefox. So how do you change the default browser in Ubuntu? The program that controls that, and lots of similar defaults, is update-alternatives. update-alternatives: error: alternative /usr/local/firefox11/firefox for gnome-www-browser not registered, not setting. Whoops! The problem here is that I'm running a firefox installed from Mozilla.org, not the one that comes with Ubuntu. What if I want to make that my default browser? What does it mean for an application to be "registered"? Well, no one seems to have documented that. I found it discussed briefly here: What is Ubuntu's Definition of a “Registered Application”?, but the only solutions seemed to involve hand-editing desktop files to add icons, and there's no easy way to figure out how much of the desktop file it needs. That sounded way too complicated. Thanks to Lyz and Maco for the real answer: skip update-alternatives entirely, and change the symbolic links in /etc/alternatives by hand. That was much simpler, and worked fine: now applications that need to call up a browser will use firefox instead of chromium. My epub Books folder is starting to look like my physical bookshelf at home -- huge and overflowing with books I hope to read some day. Mostly free books from the wonderful Project Gutenberg and DRM-free books from publishers and authors who support that model. With the Nook's standard library viewer that's impossible to manage. All you can do is sort all those books alphabetically by title or author and laboriously page through, some five books to a page, hoping the one you want will catch your eye. Worse, sometimes books show up in the author view but don't show up in the title view, or vice versa. I guess Barnes & Noble think nobody keeps more than ten or so books on their shelves. Fortunately on my rooted Nook I have the option of using better readers, like FBreader and Aldiko, that let me sort by tags. If I want to read something about the Civil War, or Astronomy, or just relax with some Science Fiction, I can browse by keyword. Well, in theory. In practice, tagging of ebooks is inconsistent and not very useful. I can understand wanting to tag details like this, but few of those tags are helpful when I'm browsing books on my little handheld device. I can't imagine sitting down to read and thinking, "Let's see, what books do I have on Interracial marriage? Or Saltwater fishing? No, on second thought I'd rather read some fiction set in the time of Edward VI, King of England, 1537-1553." And of course, with over 90 books loaded on my ebook readers, it means I have hundreds of entries in my tags list, with few of them including more than one book. Clearly what I needed to do was to change the tags on my ebooks. That ought to be simple, right? But ebooks are still a very young technology, and there's surprisingly little software devoted to them. Calibre can probably do it if you don't mind maintaining your whole book collection under calibre; but I like to be able to work on files one at a time or in small groups. And I couldn't find a program that would let me do that. What to do? Well, epub is a fairly simple XML format, right? So modifying it with Python shouldn't that hard. So I could use Python's zipfile module to access the content.opf file inside the zip archive, then use the xml.dom.minidom parser to get to the tags. Writing a script to display existing tags was very easy. What about replacing the old, unweildy tag list with new, simple tags? It's easy enough to add nodes in Python's minidom. So the trick is writing it back to the epub file. The zipfile module doesn't have a way to modify a zip file in place, so I created a new zip archive and copied files from the old archive to the new one, replacing content.opf with a new version. But I hit a snag in writing the new content.opf. Python's XML classes have a toprettyxml() method to write the contents of a DOM tree. Seemed simple, and that worked for several ebooks ... until I hit one that contained a non-ASCII character. Then Python threw a UnicodeEncodeError: 'ascii' codec can't encode character u'\u2014' in position 606: ordinal not in range(128). but Python's minidom offers no way to get that information. In fact, none of Python's XML parsers seem to offer this. Since you need a charset to avoid the UnicodeEncodeError, the only options are (1) always use a fixed charset, like utf-8, for content.opf, or (2) open content.opf and parse the charset line by hand after Python has already parsed the rest of the file. Yuck! So I chose the first option ... I can always revisit that if the utf-8 in content.opf ever causes problems. Charset difficulties aside, though, I'm quite pleased with my epubtags.py script. It's very handy to be able to print tags on any .epub file, and after cleaning up the tags on my ebooks, it's great to be able to browse by category in FBreader. Here's the program: epubtag.py. 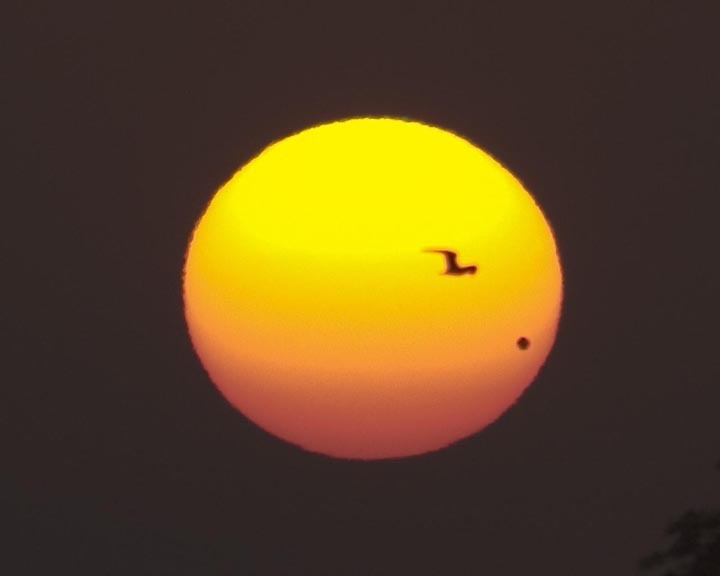 After a heart-stopping day of rain on Monday, Tuesday, the day of the Venus transit astronomers have been anticipating for decades, dawned mostly clear. For the 3 pm ingress, Dave and I set up in the backyard -- a 4.5-inch Newtonian, a Takahashi FS102, and an 80mm f/6 refractor with an eyepiece projection camera mount. I'd disliked the distraction during the annular eclipse of switching between eyepiece and camera mount, and was looking forward to having a dedicated camera scope this time. Venus is big! There wasn't any trouble seeing it once it started its transit. I was surprised at how slowly it moved -- so much slower than a Mercury transit, though it shouldn't have been a surprise, since I knew the event would take the rest of the evening, and wouldn't be finished until well past our local sunset. The big challenge of the day was to see the aureole -- the arc of Venus' atmosphere standing out from the sun. With the severely windy weather and turbulent air (lots of cumulus clouds) I wasn't hopeful. But as Venus reached the point where only about 1/3 of its disk remained outside the sun, the aureole became visible as a faint arc. We couldn't see it in the 4.5-inch, and it definitely isn't visible in the poorly-focused photos from the 80mm, but in the FS102 it was definitely there. About those poorly focused pictures: I hadn't used the 80mm, an Orion Express, for photography before. It turned out its 2-inch Crayford focuser, so nice for visual use, couldn't hold the weight of a camera. With the sun high overhead, as soon as I focused, the focuser tube would start to slide downward and I couldn't lock it. I got a few shots through the 80mm, but had better luck holding a point-and-shoot camera to the eyepiece of the FS102. Once the excitement of ingress was over, there was time to try some experiments. I'd written about binocular projection as a way anyone, without special equipment, could watch the transit; so I wanted to make sure that worked. I held my cheap binoc (purchased for $35 many years ago at Big 5) steady on top of a tripod -- I never have gotten around to making a tripod mount for it; though if I'd wanted a more permanent setup, duct tape would have worked. I couldn't see much projecting against the ground, and it was too windy to put a piece of paper or cardboard down, but an old whiteboard made a perfect solar projection screen. There was n trouble at all seeing Venus and some of the larger sunspots projected onto the whiteboard. As the transit went on, we settled down to a routine of popping outside the office every now and then to check on the transit. Very civilized. But the transit lasted until past sunset, and our western horizon is blocked by buildings. I wanted some sunset shots. So we took a break for dinner, then drove up into the hills to look for a place with a good ocean view. Our first idea, a pullout off Highway 9, had looked promising in Google Earth but turned out to have trees and a hill (that somehow hadn't shown up in Google Earth) blocking the sunset. So back up highway 9 and over to Russian Ridge, where I remembered a trail entrance on the western side of the ridge that might serve. Sure enough, it gave us a great sunset view. There was only parking space for one car, but fortunately that's all we needed. And we weren't the only transit watchers there -- someone else had hiked in from the main parking lot carrying a solar filter, so we joined him on the hillside as we waited for sunset. I'd brought the 80mm refractor for visual observing and the 90 Mak for camerawork. I didn't have a filter for the Mak, but Dave had some Baader solar film, so earlier in the afternoon I'd whipped up a filter. A Baskin-Robbins ice cream container lid turned out to be the perfect size. Well, almost perfect -- it was just a trifle too large, but some pads cut from an old mouse pad and taped inside the lid made it fit perfectly. 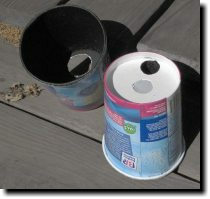 Dave used the Baader film, some foam and masking tape to make a couple of filters for his binocular. The sun sank through a series of marine cloud layers. Through the scopes it looked more like Jupiter than the sun, with Jupiter's banding -- and Venus' silhouette even looked like the shadow of one of Jupiter's moons. Finally the sun got so low, and so obscured by clouds, that it seemed safe to take the solar filter off the 90mm camera rig. 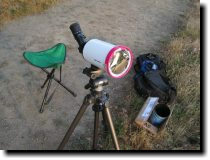 (Of course, we kept the solar filters on the other scope and binocular for visual observing.) But even at the camera's fastest shutter speed, 1/4000, the sun came out vastly overexposed with 90mm of aperture feeding it at f/5.6. I had suspected that might be a problem, so I'd prepared a couple of off-axis stops for the Mak, to cover most of the aperture leaving only a small hole open. Again, BR ice cream containers turned out to be perfect. I painted the insides flat black to eliminate reflections, then cut holes in the ends -- one about the size of a quarter, the other quite a bit larger. It turned out I didn't use the larger stop at all, and it would have been handy to have one smaller than the quarter-sized one -- even with that stop, the sun was overexposed at first even at 1/4000 and I had to go back to the solar filter for a while. I was happy with the results, though -- I got a nice series of sunset photos complete with Venus silhouette. More clouds rolled in as we packed up, providing a gorgeous blue-and-pink sunset sky backdrop for our short walk back to the car. What a lovely day for such a rare celestial event! 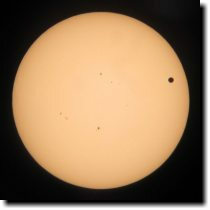 Photos here: Venus Transit, June 5 2012. Observe the 2012 Venus transit! Venus is just a small spot against the vastness of the sun -- the skies won't dim like in an eclipse, and you need equipment to see it. So why should a non-astronomer care? Mostly because it's so rare. Venus transits happen in pairs with more than a century between successive pairs: the last transit before 2004 was in 1882, and the next one after this week's won't happen until 2117. The entire 20th century passed without a single Venus transit. They're historically interesting, too. It was in 1663 that Scottish mathematician James Gregory proposed that you could calculate the distance to the Sun by measuring a Venus transit, by observing at many different places on earth and measuring parallax. Edmund Halley (of Halley's Comet fame) tried this method during the Mercury transit of 1676, but since Mercury is so much closer to the sun and farther from us, the results weren't good enough. Unfortunately, Halley died in 1742, too early for the Venus transit of 1761. But lots of other astronomers were ready, mounting expeditions that year to Siberia, Norway, Newfoundland and Madagascar (some of these expeditions were major adventures, and several books have been written about them). They followed up in 1769 with expeditions to Hudson Bay, Baja California, Norway, St Petersburg, Philadelphia... and the first voyage of Captain Cook to Tahiti, where they observed the transit at a location that's still called "Point Venus" today. Alas, their measurements weren't as accurate as they had hoped. The exact times of a Venus transit turn out to be difficult to measure due to the dreaded black drop effect, where the black circle of Venus can seem to elongate into a teardrop shape as it "tears away" from the edge of the sun. The effect seems to be caused by blurring from our own atmosphere (poor seeing) combined with telescope diffraction. So the steadier your seeing is, and the bigger and better your optics, the less likely you are to see the black drop. 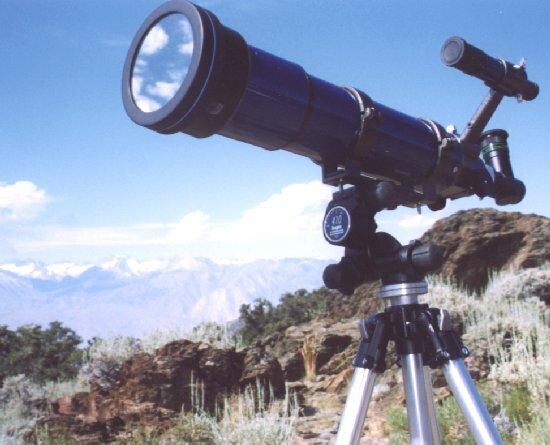 First, if you don't have a telescope of your own, don't despair -- head to your local astronomy club. Here in the bay area there are dozens of clubs, and just about all of them have public star parties planned for the Venus transit. There are events planned at local science museums, planetaria and schools as well. A few bay area links: San Jose Astronomical Association, Peninsula Astronomical Society, San Francisco Sidewalk Astronomers, San Francisco Amateur Astronomers, or any of the others on the AANC's list of Amateur Astronomy Clubs in Northern California or the SF Chronicle's list of astronomy clubs. And the Hubble Space Telescope will be watching the transit by looking at light reflected off the moon. But suppose you're viewing it on your own? You don't need a big telescope. I used an Orion solar filter on my little 80mm f/7 refractor for the last Mercury transit and it worked great. And Venus is much larger than Mercury, at about 50 arcseconds versus Mercury's 12 (the sun is half a degree, or 30 arcminutes). So if you've seen a Mercury transit, you can imagine how much easier and more spectacular a Venus transit can be. If you use binoculars, either make sure that you have solar filters for both sides, or keep one side covered at all times. If your telescope has a finderscope, keep it covered. Use a cheap, low powered eyepiece for this: the eyepiece will get hot, and you don't want to risk damaging a fancy eyepiece. Be careful with solar projection -- make sure nobody nearby can walk between the telescope and the surface you're using as a projection screen, or place their hands or eyes in the light path. A web search for solar projection will uncover other tips. You can project the sun's image with binoculars, too, so don't feel left out if you don't have a telescope. You'll definitely want a tripod mount. I tried binocular projection during last month's annular eclipse, and found it very fiddly to hold the binoculars just right. Don't count on being able to hold them steady while also looking for Venus on the projected image. If you don't have a tripod adapter (try Orion), cobble something together with duct tape and a block of wood, or whatever you have handy. And do try to get a good white surface to project onto. Concrete worked well enough for the solar eclipse, but you'll want better resolution for Venus. Seen from the bay area, Venus begins its ingress onto the disc of the sun on 3:06 PDT on the afternoon of June 5. The transit continues until after the sun sets at 8:26. So we won't get to see egress. Venus's exit from the face of the sun, but it's the mirror image of what we'll see at ingress. Ingress has two parts: first contact, when the edge of Venus's disk first touches the outside of the sun's disk, and "internal ingress" or second contact, when Venus's disk is fully inside that of the sun. Second contact is the most interesting period of the transit, since it's when the "black drop effect" occurs. At first contact, the sun will still be high for bay area observers, 60° up. By maximum transit the pair will have sunk to 21°, still plenty high enough to see the spectacle. Photographers will want to wait around for sunset for a chance at some spectacular photos, like the Bill Arnett photo at the top of this article, taken from Chicago. Want more details or times from other locations? 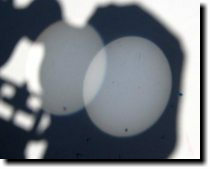 transitofvenus.org has plenty of links, as does Everything you need to know about next week’s Transit of Venus. Stay safe, and enjoy this once-in-a-lifetime event!